Operation Care Package relies on patriotic Americans to help us continue our efforts of making sure that no Hero serving our country is forgotten. This is especially true of the fast approaching Holiday Season, with so many of our Troops far from home. 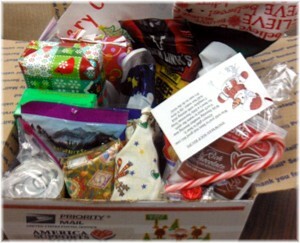 Thanks for helping us "Send Santa To The Troops!" Monetary Donations & Supplies URGENTLY Needed! 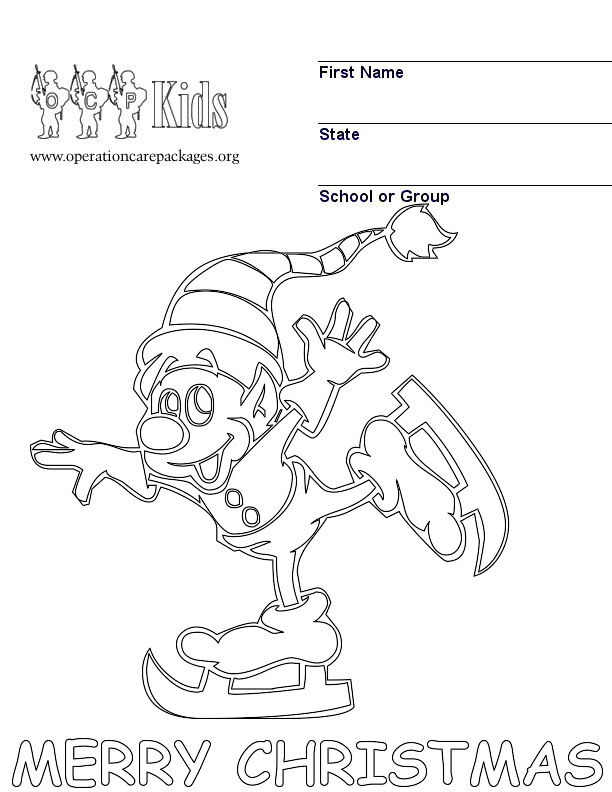 Operation Care Package is a volunteer 501(c)(3) public charity. All donations are used to help pay shipping costs and items needed that we do not receive from donations. The estimated shipping cost for 2016 will be approx $40,000. Donations may be made by check, money order, or paypal. To use paypal, click on the donate button at the Home Page. Operation Care Package has teamed up with Wreaths Across America. and help us get more Christmas Packages to our Troops. These beautiful Christmas Packs include many of the necessities included in our regular packages, along with loads of treats from Santa! Here's a great way to Support our Troops while you shop for Christmas! to help us pay for shipping costs of the Care Packages. There is no cost to you, and you will still receive Amazon's great prices when using Amazon Smile. We are asking all Americans if they would consider donating one First Class Stamp to be used for postage for cards, letters, and Care Packages. We need 10,000 Stockings that we can stuff and add to the Christmas Care Packages. Stockings can be made of fabric or felt. 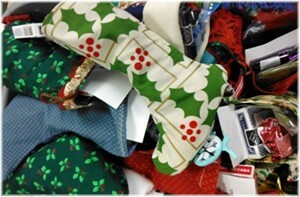 OCP is in need of handmade items for Christmas packing and throughout the year. At this time only mini drawstring bags needed. approximate size 4in wide x 7in tall any cotton material any patterns. 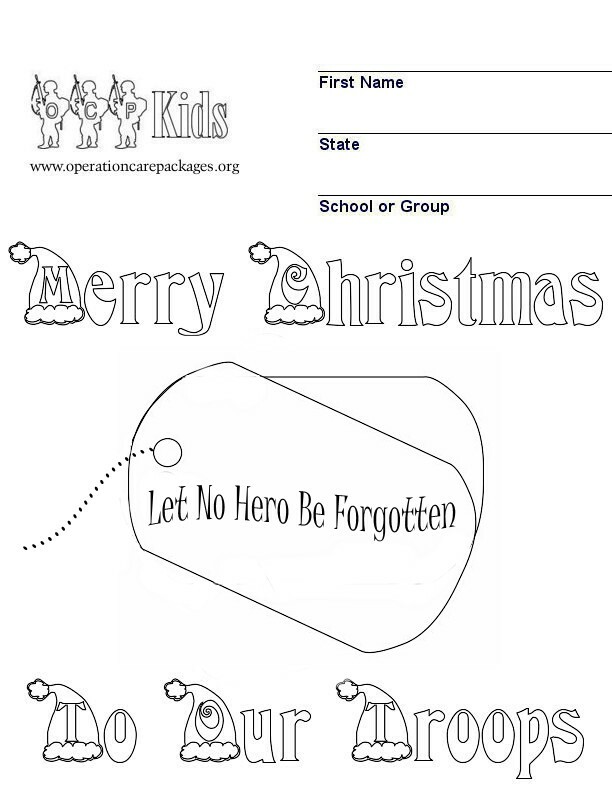 Here are some items OCP can really use for Christmas and usually can be found at discount stores for $2 to $5 each. We need thousands of gifts for Christmas and we are starting to collect now. Please consider picking up some. The following is a list of items that are also especially needed to add Holiday cheer to packages. 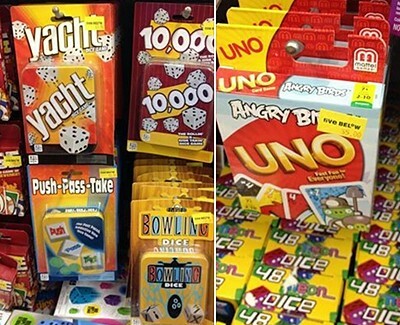 iTunes, Walmart, Best Buy Gift Cards, etc. Mircophones, small karaoke machines & music. P.O. Box 175 / 120 Jessie St. Nothing brings a smile to a soldier's face like a letter from a kid. We would like to receive hand drawn pictures and letters from children in schools, groups, individuals, Confirmation classes, Sunday Schools, etc. Below are Christmas Color Pages that can be used. and "save as" to your computer. 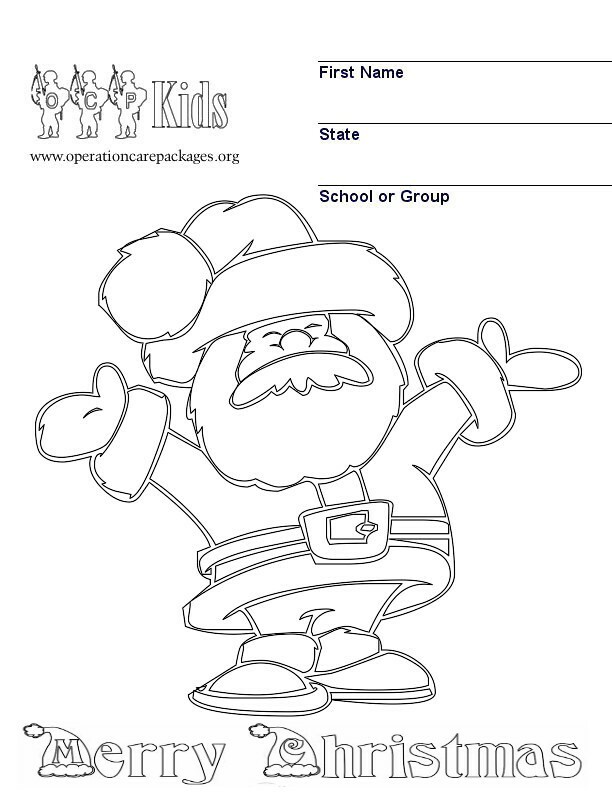 Be part of the team of OCP Kids helping to send "Santa" on his way to our Troops! Local residents in Joliet & Manhattan, Illinois & surrounding areas. Check our Events page for exact dates and times. OCP is in need of areas to leave drop off boxes. If you know of a grocery store or business with a central location that would allow us to leave a box, please contact us. Volunteers are also needed to pick up donated Christmas items, (also, on a regular basis) and transport to our packing office. This could require some heavy lifting. As donated items come in, they must be inspected and sorted into different categories. Items must be appropriate for sending - no opened food packages, checking for expiration and sorting into areas....hygiene, food, items for the kids, etc. Donated items are all placed into ziplock bags. Examples are: snacks, hygiene, canned foods in bags, etc. This protects the contents of the package against leakage, should any part of the package get crushed during shipment. We also need individuals to bag separate 'hygiene packs'. Once items are sorted and bagged, they are placed into the boxes. Boxes need to be taped, packed tightly, letters enclosed - and then, closed, taped and stacked. We are in need of local residents who have a pick-up or van and are willing to help haul care packages to the post office. This also requires some heavy lifting and bending, as packages weigh approx 8 to 20 lbs. 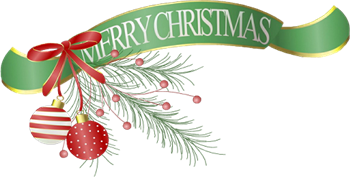 Although packages are mailed weekly year round, there will be large shipments on a daily basis during Christmas packing. Any amount of time that can be donated is a huge help. 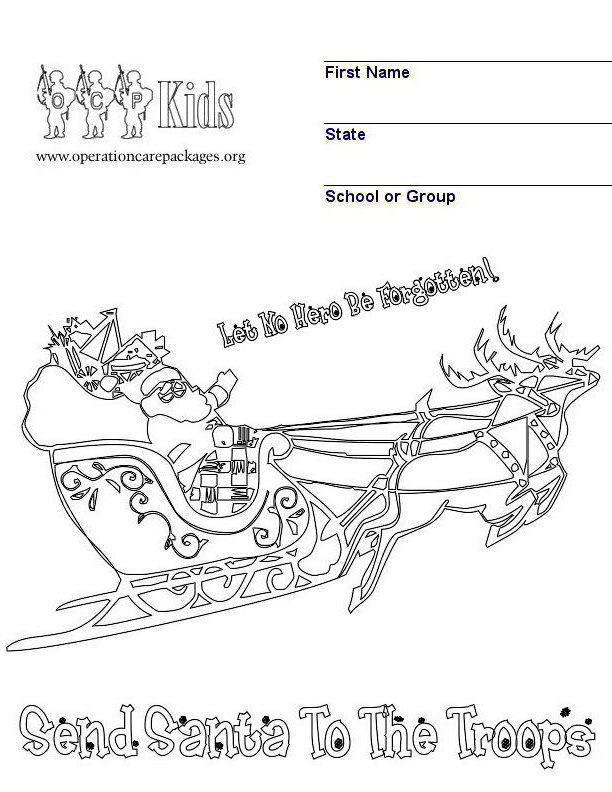 Let's all help "Send Santa To The Troops" this Holiday Season. Music: Still Nacht by Mannheim Steamroller, from the album Christmas.